By compiling in the cloud with PhoneGap Build, you get all the benefits of cross-platform development but can still build apps just the way you like. PhoneGap Build allows develops to go from code to app without needing to compile and work on their machines. Launching with Andriod, Palm, BlackBerry OS and Symbian with iOS and Windows Phone 7 coming soon PhoneGap Build looks like a great companion to the existing PhoneGap SDK. 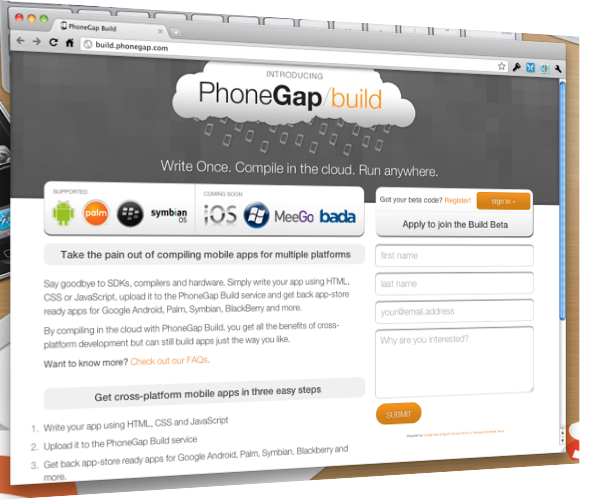 PhoneGap Build is accepting beta testers now, just sign up to apply and try it from the PhoneGap Build homepage. True to Nitobi form the guys (Andre, Alex, and crew) are trotting all over the place right now. Nitobi Founder Andre Charland gave attendees of Deploy 2010 a sneak peak at PhoneGap Build today, but the real launch is tomorrow. Implications: Mobile apps are probably some of the hottest things in software right now. While nothing replaces skill, training, and practice, having a service that could allow you to build you apps faster deploy onto several platforms at once—that can only help you make an app a success. Even if it’s just for rapid prototyping, I can see real potential in having the cloud compile your app for you. Almost makes me want to learn how to make apps.